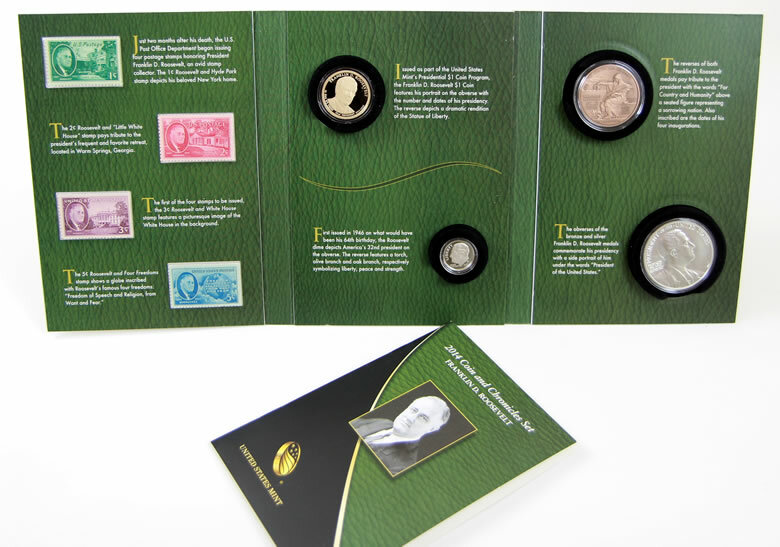 The fourth and final 2015 Coin & Chronicles Set features Lyndon B. Johnson. It sold out last week within four hours of its release, joining this year’s other three sets that are no longer available. New United States Mint sales figures have its total at 24,221 of the possible 25,000. In the latest development, last year’s Franklin D. Roosevelt Coin & Chronicles Set went off sale today. Lacking a reverse proof $1, the older set doesn’t have the collectible pizazz of this year’s sets. It does have two appealing medals, four stamps, a standard proof dollar and a standard proof dime — all featuring FDR. The chronicles set always saw a sales spurt around the time one of newer ones launched. The latest stats have it up 750 to 19,045 of the possible 20,000. The LBJ and FDR sets were among the Mint’s most popular products. The U.S. Mint published sales updates to 243 numismatic products. Fifty-four of them outperformed their prior weekly sales compared to 164 previously. Ten of them increased by more than 1,000 units compared to 14 previously. Eighteen had their sales reduced compared to 13 previously. As discussed in earlier articles, the 2015-P Blue Ridge Parkway Five Ounce Silver Uncirculated Coin sold out on Thursday and the 2015-W $100 American Liberty High Relief Gold Coin sold out on Tuesday. The latest sales figures have the silver coin rising 34 to 17,488 and the gold coin gaining 578 to 45,421. Below are tables showing the latest sales for U.S. Mint numismatic products. The sales period covers Oct. 26 to Nov. 2. Products with an asterisk (*) are no longer available. The 2015 First Spouse Bronze Medal Sets were released on September 21, 2015 with a mintage limit of 20,000. They are currently no longer available. Mike, thank you once again for an informative update. In addition to owning all four of the “2015 Coin & Chronicles” sets, I just received my “2014 FDR Coin & Chronicles” set and I am also very impressed with the set. It’s beautiful. I am very happy I decided to pick one up. Interesting/strange supposed less (696 –4.37%) 2015-p 5 oz bombay sold from last week. People on E Bay are making a lot of money off of these sets. Between the postage, insurance, eBay & PayPal fees the cost to Sell can approach 40% of the total received. Mike, you can sell these on Ebay??? Thanks for your informative comments & statistics on this numismatic website. I collect, among other items, bronze & silver medals of many types, but missed out on getting the 2014 First Spouse Bronze Medal Sets offered by the U.S. Mint. They were sold out quickly & i was caught off guard like many from what i hear. What are these sets going for now from your sources? I dont buy on eBay as a matter of personal principle but wonder what they are currently valued at as a price range? Could you please provide me with some insights on this subject? Thanks again for your comments on this cool website.